Apologies for the late start, but in honor of Black History Month, I will feature an accomplished black female athlete every day on the blog. My goal is to educate readers about the lesser known black women in sports, so don’t expect too many posts about the Williams sisters and Candace Parkers of the world. Hope you enjoy and learn a thing or two…or three. Feb. 6: Today’s post honors the great Alice Coachman. 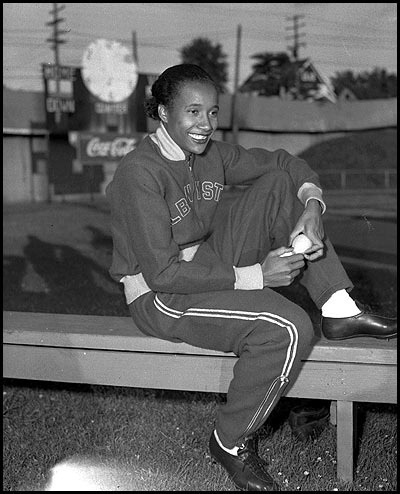 Alice Coachman became the FIRST African-American woman to win an Olympic gold medal when she won the high jump at a height of 1.68m in the 1948 Summer Olympics in London. The fifth of five children, Coachman was born in Albany, Georgia in 1923. In 1939, as a sophomore, Coachman enrolled in the Tuskegee Institute’s high school program and the summer before school began she won the AAU National Championship in the high jump. After raking in numerous titles in high school, Coachman went on to compete in track and field for Tuskegee at the collegiate level. There she won a host of national titles in the 50-meter dash, 100-meter dash, 400-meter relay and the high jump. She also took her talents to the basketball court where she won 3 national championships with Tuskegee, and became a 5-time All-American. Coachman graduated from Tuskegee in 1946 with a degree in dressmaking and obtained a B.A. in Home Economics from Albany State College in 1949. Because World War II forced the cancellation of the 1940 and 1944 Olympic games, Coachman was not initially able to showcase her talents on an international level. But in 1948, at the ripe age of 25, Coachman easily claimed victory in the high jump, making her an instant star. Coachman retired after her Olympic debut but went on to collect endorsements, taught, coached and became involved in Job Corps. Coachman founded the Alice Coachman Track and Field Foundation to help Olympic athletes adjust to life after the games. Yeah, she’s pretty much a legend.